Tomahawk is a game which was designed by Saucify, a slot developer with plenty of titles under its belt and with a good reputation. Their games are often filled with features, and this is the case here as well. The theme is based on Native American traditions and culture, showing plenty of things that most people known about them but also including some that are less common. It’s a game which relies on 243 ways to win which are offered on 5 reels. There are also free games, a bonus feature, multipliers, scatters and wilds. The big prize of the slot is worth $875. 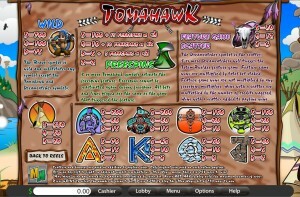 Tomahawk’s features include the wild symbol, the free spins, multipliers, scatters and even a bonus game. The icon with the Brave Warrior is the one chosen to act as the wild in this case. It’s going to be useful in more ways than one, being able to form combinations directly, or act as a substitute and be part of something that regular icons are trying to create. If the former is the case, you can get paid 75x to 700x the line bet, by getting three to five wilds arranged on a payline, from left to right. As for the substitution ability, if it is activated then it will work with regular symbols only, not with scatters. There are two things that the scatter symbol with the Tomahawk can give you. One of them is the free spins, which I’m going to talk about below. The other is a cash prize, which is offered when at least two icons of this type are present at the same time. The payouts vary between 2x and 100x the bet. As for the free spins, you can win 5 rounds with 2x multipliers when you have three scatters, 10 spins with 2x multipliers for four scatters, and 15 spins with 3x multipliers when all five are present. These free spins may not be activated again while the current ones are running. The slot’s bonus game gets triggered by the presence of 3+ scatter symbols with the Dreamcatcher on them. You’re also getting paid at the same time, the amounts being worth between 6 and 80 times the total bet, for three to five icons. The bonus game is started by the same number of scatters, three or more, and it will take you to a screen where you have to build a Totem Pole of your own, by using various symbols. You need multiples of 25 coins in this slot, to place a bet and activate all the ways to win. 1 to 5 coins are used for each of the 25 virtual lines, so the largest wager uses 125 coins. Each coin’s denomination is between $0.01 and $0.25, so you end up with line bets of $1.25 and totals of up to $31.25. The game’s top payout is at only 700 times the line bet, which in the case of this game would mean a cash prize of $875 at best. The design of the game does look Native American, with the reels being placed on a large piece of leather, while the borders are made out of Totem poles or sticks of wood. Teepees are shown in the background, with a lovely picture of nature further away and a river on the left side of the reels. The symbols are related to Native Americans, to spirits and things like water, clouds or fire. Symbols: Brave Warrior (wild, 700x), Tomahawk (scatter, 100x the bet), Dreamcatcher (scatter, 80x the bet), Teepee (350x), Fish Spirit (200x), Eagle Spirit (200x), Insect (150x), Dog (150x), Ace (70x), King (65x), Queen (50x) and Jack (40x). It’s a more modern Native American slot machine, and while it has the lower prizes that ways to win often offer, it also has a lot of cool features inside. 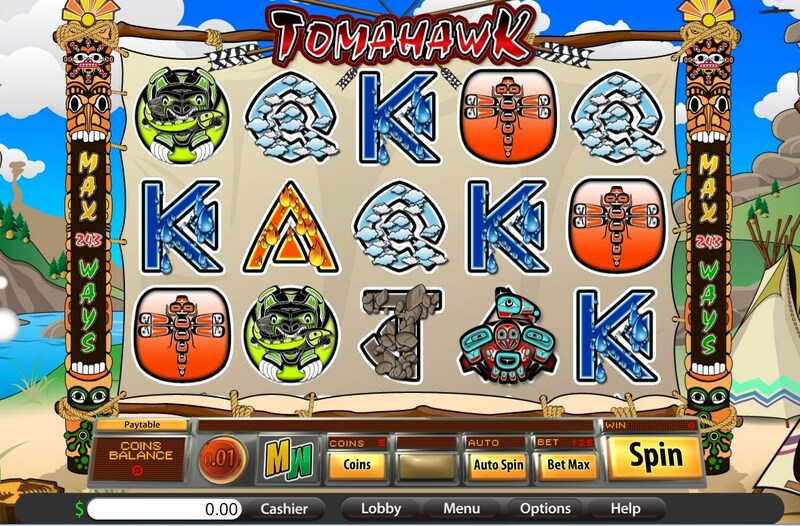 You will find Tomahawk at any online casino which chooses to use software from Saucify/BetOnSoft , playable either for free or for real money.